O foliant a wnaf eli! 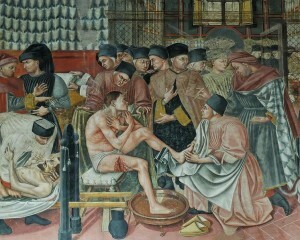 Medication against sickness was a necessity in the Middle Ages, as today. However, medical knowledge was poor and underwent little development, although medical texts in Welsh were produced in increasing numbers from the fourteenth century onwards. Epidemic diseases were still common, notably the plague, which continued to spread in the fifteenth century. It is quite possible that Guto'r Glyn himself suffered from a chronic illness (see Guto’s illness), and as he aged he seems to have suffered those ailments that are usual in the elderly. The main focus of medical lore was on the properties of various ‘natural’ things such as vegetables, herbs, precious stones and even the moon, stars and planets. Religion was also crucial, as shown in the poems which relate to healing. Guto’r Glyn composed three poems asking for his patrons to be healed, one for Abbot Rhys ap Dafydd of Strata Florida (poem 5), one for Dafydd ap Ieuan ap Llywelyn (poem 69) and one for Hywel ap Ieuan Fychan of Moeliwrch (poem 92). Although no specific medical treatments are discussed in these poems, they do refer to saints, holy ointments and healing springs, all traditional cures employed in treating wounds and preventing diseases in this period. : For a full discussion on these poems see B.O. Huws, '‘Llawer dyn … / Â chywydd a iachawyd’: Guto’r Glyn yr iachawr' in B.J. Lewis, A. Parry Owen & D.F. Evans (eds), ‘Gwalch Cywyddau Gwŷr’: Essays on Guto'r Glyn and Fifteenth-century Wales (Aberystwyth, 2013), 00-00.